This white chicken chili recipe is one of the first ones I make each fall as soon as the weather cools off and I’m craving a hearty and delicious soup. 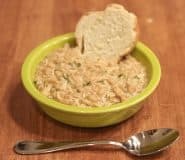 Since it’s a crockpot dish, it’s also perfect for summer when you don’t want to heat up the whole darned house with the oven or stove. 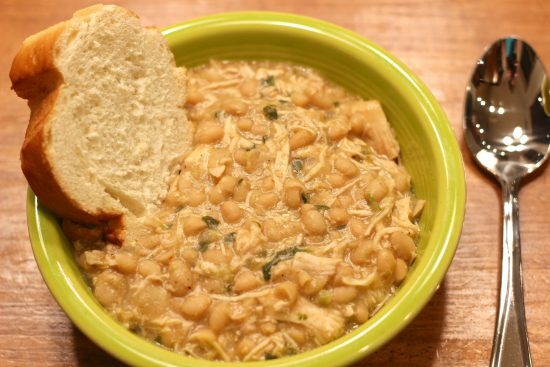 The best part about this white chicken chili recipe is how easy and fast it is to throw together. You put almost all of the ingredients in the slow cooker in the morning and just forget about until its getting close to dinner time. That’s my kind of cooking! For anyone looking to avoid dairy, this recipe is for you! During my youngest son’s first year and a half, we dealt with a lot of food sensitivities. I eventually found that by strictly avoiding dairy and soy products, he could nurse without having any issues. Canned coconut milk became my go-to substitute for any milk or cream in recipes. Even though Little O is almost three now, no longer nursing, and has outgrown his problems with dairy, I still make this recipe dairy-free because it is delicious that way! 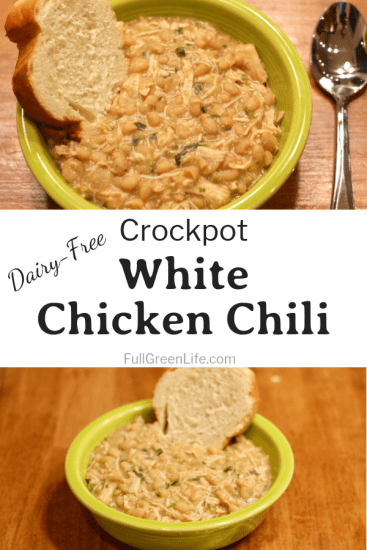 I would just love to know what you think of it after trying this white chicken chili for yourself! Pin it to your recipes board on Pinterest, and let us know when you’ve “tried it” with a comment on what you thought! This is a hearty dairy-free recipe that is great for cooler weather or hot weather when you don't want to heat up the house with the oven! Feeds a hungry crowd. Great with a side salad and loaf of french bread. Add all ingredients except the cornstarch and cilantro to the crockpot. Turn crockpot on high for 6-8 hours. Stir all ingredients together to let chicken fall apart and distribute. Remove 1-2 cups of liquid from crockpot and whisk in the cornstarch in a separate bowl. Once it is smooth, pour it back into the crockpot and stir to combine. Let cook for another 20-30 minutes until the chili has thickened. Stir in the chopped cilantro soon before serving. Serve with a side salad and a slice of bakery bread.